Auto-immune bullous diseases that include pemphigus vulgaris, paraneoplastic pemphigus, bullous pemphigoid, cicatricial pemphigoid, dermatitis herpetiformis etc., can be extremely debilitating and fatal. They need early and proper treatment to prevent further morbidity or mortality. To control these diseases, generally physicians use corticosteroids and immunosuppressive drugs as adjuvants. In Ayurveda various herbal and herbo-mineral preparations are described which are found to be effective in autoimmune diseases. Among them, herbo-mineral preparations such as Ārogyavardhinī Rasa and Gandhaka Rasāyana are widely prescribed by Ayurvedic physicians and are reported to provide promising results in a wide range of skin disorders. Some Ayurvedic herbs are also found effective in management of skin diseases internally and externally. Herein we report in this case study, a patient diagnosed with Autoimmune bullous disease (bullous pemphigoid) and was successfully treated with Ayurvedic management. A 40 year old, non-diabetic male patient, working in Brass industry was presented with two months history of persistent extensive and severe stomatitis with recurrent oral ulcers leading to difficulty in oral food intake even in liquid form. Recurrent flaccid, fluid filled bullae all over body were also present, which turned to crusting erosions after getting ruptured during course of healing. He was having redness, severe pain, burning, non foul smelling, serous oozing from lesions and disturbed sleep. He was diagnosed as a case of lichen planus two months back and later on was primarily diagnosed by another dermatologist as a case of bullous skin disease (?bullous pemphigoid) [Table 1]. 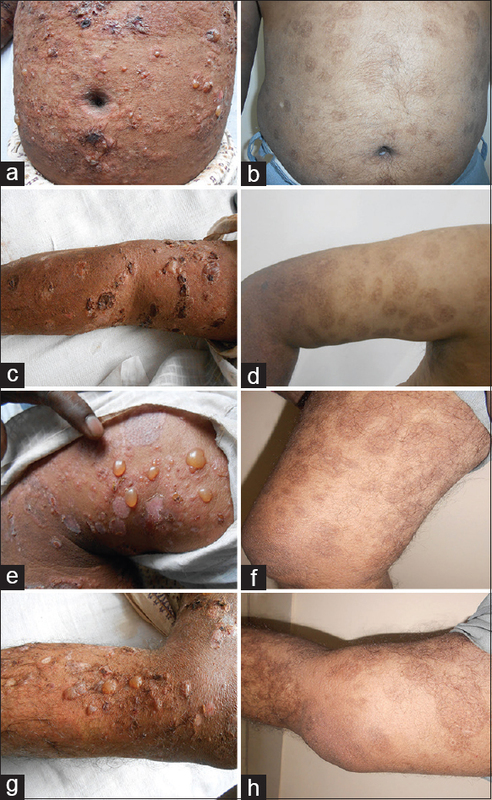 The clinical signs and symptoms like erythema, urticaria surrounding the bullae, tense bullae and settled hemorrhagic blisters were suggestive of bullous pemphigoid. Due to the poor economical condition of the patient, biopsy or tzanck smear investigation was not possible for firm diagnosis. Due to insignificant relief of the therapy, the patient was referred for Ayurvedic medication [Table 1]. 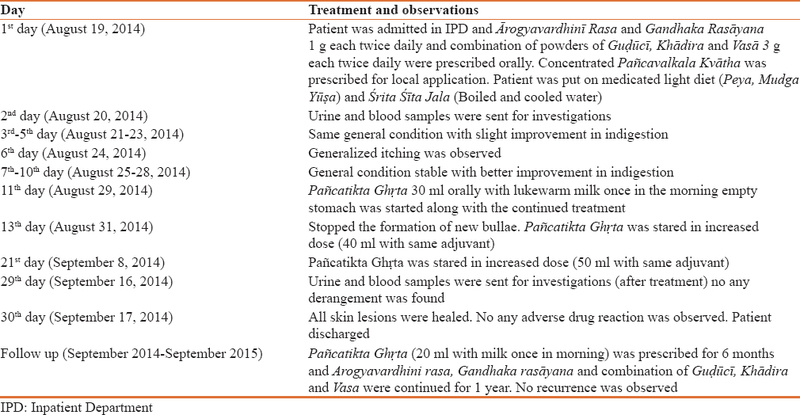 The patient was clinically diagnosed as Visphoṭaka (bullous skin disorder) and hospitalized in indoor patient department and was put on below described Ayurvedic management [Table 2]. Blisters all over the body associated with burning sensation, fever and thirst are the symptoms of Visphoṭaka described in Ayurvedic classics., In pathogenesis of Visphoṭaka, tridoṣas (vāta, pitta and kapha) are involved with predominance of pitta and kapha. Treatment prescribed by dermatologist was withheld. The patient was prescribed oral administration of Arogyavardhini Rasa and Gandhaka Rasāyana, one gm each and combination of powders of Guḍūcī (Tinospora cordifolia Willd. ), Khādira(Acacia Catechu Willd.) and Vasā (Adhatoda vasica Nees. ), three gram each, twice daily; Local application of concentrated Pañcavalkala Kvātha[decoction of the barks of five herbs, namely Ficus benghalensis Linn. (Vaṭa), Ficus glomerata Roxb. (Udumbara), Ficus religiosa Linn. (Aśvattha), Thespesia populnea Soland. ex Correa. (Pāriśa) and Ficus lecor Buch. Ham. (Plakṣa)] was prescribed throughout the treatment period. He was evaluated for routine haematological, urine and biochemical investigations on admission and before discharge. Pain and burning sensation were found decreased after local application. On sixth day of hospitalization, generalized itching was observed but the formation of new bullae was found decreased. Upon improvement of status of agni, on 11th day, Panñcatikta Ghṛta [ghee based preparation of 5 bitter herbs viz. Azadirachta indica Linn. (Nimba), Luffa acutangula (L.) Roxb. (Paṭola), Solanum surattense Burm. F. (Kaṇṭakārī), Tinospora cordifolia (Willd.) Miers. (Guḍūcī) and Adhatoda vasica Nees. (Vasā)] 30 ml orally with lukewarm milk once in the morning empty stomach was added to above described treatment. Dose of Panñcatikta Ghṛta was increased to 40 ml per day on 13th day and 50 ml per day from 21st day after assessment of status of agni and palatability which was continued till the day of discharge. Frequency of new formation of bullae, oozing was significantly reduced on 13th day, with marked healing of older lesions and complete cessation of formation of new bullae from 16th day onwards. There was marked improvement in mouth ulcers, difficulty in food intake and sleep on 13th day. 90% of the lesions healed within 20 days. Generalized itching reduced by 22nd day of treatment. 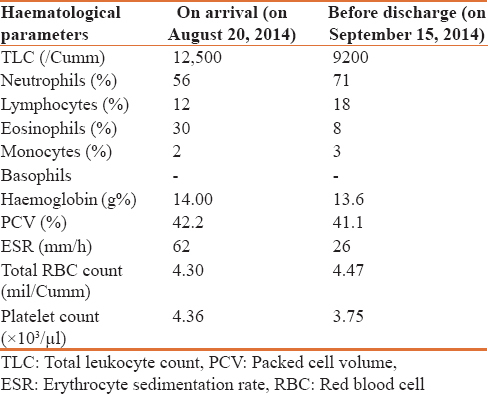 There was reduction in raised total WBC count, ESR and Eosinophils [Table 3]. 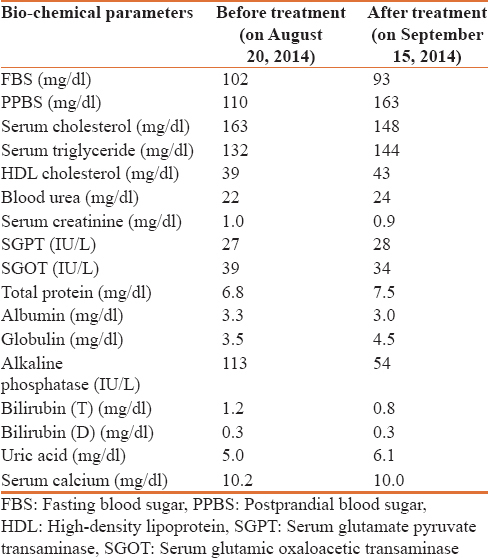 Biochemical markers were within normal limits before discharge [Table 4]. On the day of discharge (30th day), all skin lesions were healed and similar ongoing treatment was prescribed on the day of discharge. This showed good results [Figure 1]. There was no fever and any medical or surgical emergency during hospital stay. Panñcatikta Ghṛta (20 ml with milk once in morning) was prescribed for 6 months and Ārogyavardhinī rasa, Gandhaka rasāyana and combination of Guḍūcī, Khādira and Vasā were continued for one year in the follow-up period. During follow up period, no recurrence was observed. Generalized itching, pronounced over forearms and hands was noted during follow up, which was probably due to chemical exposure and this subsided within two to three days with local application of Pañcavalkala Kvātha. No adverse drug reaction was noticed during treatment and follow up period. Conventional (allopathic) anti-inflammatory drugs are the mainstay of treatment for various auto-immune disorders. Owing to the side effects and the high cost of conventionally used anti-inflammatory drugs; patients are increasingly using complementary and alternative medicine (CAM) modalities of treatment. Here the patient had severe spread of the disease and did not improve with the conventional treatment modalities. Because of the secondarily infected skin erosions, life-threatening sepsis had developed. Therefore, it was decided to treat him with Ayurvedic management. On review of Ayurvedic classics, many medicines are found most recommended for various auto-immune skin disorders. Safety and efficacy of Ārogyavardhinī rasa have been proven by research scholars.Picrorhiza kurroa, a major component of Ārogyavardhinī rasa, has choleretic effects. Along with this we started the combination of three potent herbs for getting quick effects and found good results in all symptoms. As Ayurvedic single formulation contains many herbs and minerals, proper mode of action of the formulation is difficult to describe. Various researches have proven the pharmacological actions of the medicines used in this case [Table 5]. Among the medicines, Khādira, Vasā, Panñcatikta ghṛta and Pañcavalkala Kvātha may have caused anti inflammatory effect, while Guḍūcī and Panñcatikta ghṛta the immuno-modulatory effect. Wound healing properties of topical formulation helped in healing of wound created by blisters. Anti microbial, Anti fungal, analgesic and hepato-protective actions prevent associated symptoms of the disease. The presented combination and management by Ayurvedic medicament is found to be a good alternative therapy in autoimmune bullous disorder. Long-term prospective studies are required to substantiate the data. Bickle K, Roark TR, Hsu S. Autoimmune bullous dermatoses: A review. Am Fam Physician 2002;65:1861-70. Kanwar AJ, Sawatkar GU, Vinay K, Hashimoto T. Childhood pemphigus vulgaris successfully treated with rituximab. Indian J Dermatol Venereol Leprol 2012;78:632-4. Shastri A, editor. Vagbhatta, Rasa Ratna Samuchchaya, 20/87-93, 10th ed. Varanasi: Chaukhamba Amarbharati Prakashana; 2015. p. 435-6. Anonymous. The Ayurvedic Formulary of India Part II. Churnadhikara, Gandhaka Rasayana. New Delhi: Department of ISM and H Government of India; 2000. p. 115. Patel F, Wilken R, Patel FB, Sultani H, Bustos I, Duong C, et al. Pathophysiology of autoimmune bullous diseases: Nature versus nurture. Indian J Dermatol 2017;62:262-7. Acharya YT, editor. Agnivesha, Charaka Samhita, Chikitsa Sthana 13/90. Reprint. Varanasi: Chaukhamba Surbharati Prakashan; 2011. p. 490. Acharya YT, editor. Sushruta, Sushruta Samhita, Nidana Sthana 13/18. Reprint. Varanasi: Chaukhamba Surbharati Prakashan; 2013. p. 320. Acharya YT, editor. Agnivesha, Charaka Samhita, Chikitsa Sthana 7/30. Reprint. Varanasi: Chaukhamba Surbharati Prakashan; 2011. p. 450-1. Anonymous. The Ayurvedic Pharmacopoeia of India, Part I. Vol. I/27, Reprint. New Delhi: Ministry of Health and Family Welfare, Govt. of India; 2001. p. 41. Anonymous. The Ayurvedic Pharmacopoeia of India, Part I. Vol. I/46, Reprint. New Delhi: Ministry of Health and Family Welfare, Govt. of India; 2001. p. 70. Anonymous. 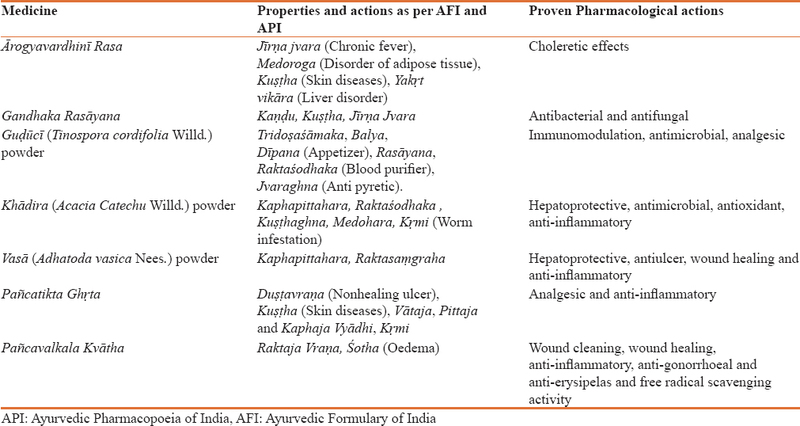 The Ayurvedic Pharmacopoeia of India, Part I. Vol. I/76, Reprint. New Delhi: Ministry of Health and Family Welfare, Govt. of India; 2001. p. 122. Chunekar KC, editor. Bhava Mishra, Bhava Prakasha Nighantu, Vataadi Varga 15. Revised Edition. Varanasi: Chaukhambha Bharati Academy; 2010. p. 507. Anonymous. The Ayurvedic Formulary of India Part I. Ghritadhikara, Panchatikta Ghrita. New Delhi: Department of ISM and H Government of India; 2000. p. 269. Venkatesha SH, Rajaiah R, Berman BM, Moudgil KD. Immunomodulation of Autoimmune Arthritis by Herbal CAM. Vol. 2011: Evidence-Based Complementary and Alternative Medicine; 2011. p.1-13. Kumara G, Srivastavaa A, Sharma SK, Gupta YK. Safety evaluation of an ayurvedic medicine, Arogyavardhini vati on brain, liver and kidney in rats. J Ethnophrmacol 2012;140:151-60. Shukla B, Visen PK, Patnaik GK, Dhawan BN. Choleretic effect of picroliv, the hepatoprotective principle of picrorhiza kurroa. Planta Med 1991;57:29-33.